Blazing Fast Printing. Fast color and black printing - up to 19ppm to help improve your productivity. 3.7" Color Touchscreen Display. Easily navigate menus by tapping or swiping on the 3.7" color Touchscreen display with Web Connect‡. Connect to the web directly from the Web Connect Touchscreen Interface to access your account on EVERNOTE, DROPBOX or BOX and more‡. Wireless Networking. Easy to install on your wireless network or print locally via USB from your computer‡. 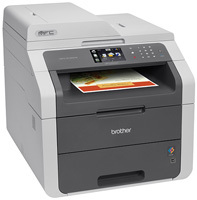 If you're looking for a fast, reliable Digital Color All-in-One with wireless networking for your small business, the Brother MFC-9130cw may be exactly what you need. It takes big business features like a 3.7" color Touchscreen display and wireless networking, and packs them into an affordable, compact All-in-One designed to fit your small business budget and workspace. It prints and copies high-impact color and crisp black documents at up to 19ppm, and scans and faxes, too. It's ideal for businesses that need an All-in-One to primarily print black business documents, but also need to print professional-quality color documents in-house from time to time. It also offers wireless printing from your mobile device via‡: AirPrint®, Google Cloud Print™, Brother iPrint&Scan, Cortado Workplace and Wi-Fi Direct®. Customer Support. 1-year limited warranty with free phone support for the life of your product. (Yields approx. 2,500 pages in accordance with ISO/IEC 19798 (Letter/A4)). (Yields approx. 1,400 pages in accordance with ISO/IEC 19798 (Letter/A4)).